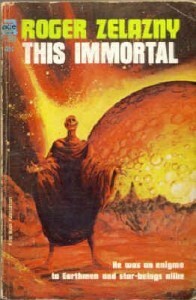 In 1966 the Hugo Award for best SF novel was a tie between this book, Zelazny's debut novel, and Frank Herbert's "Dune". In retrospect this is possible a slightly surprising decision since one of those books has been significantly more influential than the other, but while this isn't as genre-defining a work as Dune is, it is still a fine novel. It's also a lot shorter than Dune, but Zelazny does manage to pack a lot into what by modern standards would be a very brief novel. The premise of a seemingly immortal man acting as a tour guide for an alien writer through the ruins of a post-apocalyptic Earth devastated by a nuclear war and abandoned by most of the human race does make for an interesting journey through an intriguing setting. Although a Science Fiction novel there's also a heavy influence from mythology, particularly Greek mythology, and some of the more unlikely plot developments and pieces of world-building make more sense in terms of a mythical story rather than a traditional SF novel. The plot does require a high tolerance for unlikely coincidences, but I don't think it really detracts from the novel. At first it can be hard to see where the plot is going and some things are initially puzzling, but the ending of the novel does manage to clear up some of the odder plot developments and it makes for a satisfying conclusion to the story. The characters do initially seem to be archetypes, but do acquire some more depth as the story goes on as their initially hidden motivations become apparent. I'm not sure some of them are necessarily believable characters, but they are memorable and it's the kind of story which almost demands larger-than-life characters. The protagonist, Conrad, is the most interesting of them and feels like a prototype for later Zelazny heroes such as Corwin of Amber or Lord of Light's Sam. Zelazny has always been a fantastic writer of prose, and while Zelazny's writing maybe isn't quite as assured as in later work such as Lord of Light or Creatures of Light and Darkness, it's still very well written with plenty of memorable and powerful passages of writing. This might not be Zelazny's best novel, but it's still a very good read.